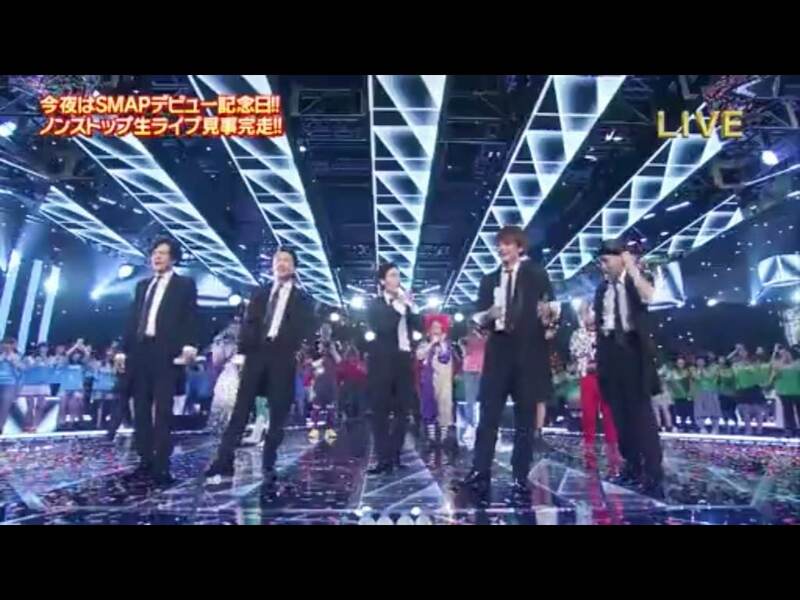 I’ve seen SMAP’s performance of their 50 hits on SMAP x SMAP (to celebrate their 22nd year since their CD debut–thanks for pointing that out @FindAiba), which can be watched here. As I said on Twitter, something has to be said about the group’s agility (at their age) and longevity, all things considered. And as an Arashi fan, I could only hope that the boys will learn a thing or two from their senpais so that 11 years from now, they’ll mark their silver anniversary with as much grace and vigor. The SMAP performance becomes even more relevant now as Arashi marked its 14th year yesterday, and started a “power-up” version of their variety show on NTV, SHIYAGARE last Saturday. It is also at this point that I give this warning: stop reading RIGHT NOW if you’re the type of fan who doesn’t want to hear anything negative about Arashi. That said, let me say it again that I’m an Arashi fan and I love the boys dearly. But that won’t stop me from giving what I think is constructive criticism. On the one hand, I’m not exactly a SMAP fan but I have listened to their music, liked some of them (my faves are Hitotsu Dake no Hana and Dear Woman) and watched some of KimuTaku’s dramas as well as a couple of SMAP x SMAP. I have a lot to say about SMAP but I’d keep them to myself because this post is focused more on the positive things that I hope Arashi learns from SMAP, considering that their senpais have lasted 25 years in the industry (counting from the year they were formed in 1988) filled with fickle-minded fans and harsh idol realities. To be honest, last Saturday’s episode of SHIYAGARE was a huge let-down. I don’t know if I should attribute it to my non-existent Japanese or to the guests, Cream Stew. But I gather I’m not alone because Japanese Twitter was reportedly full of noise about the show’s format. In the first place, it was not at all a “power-up”, and not even that horse logo (why a horse, tell me?) that others have mistaken for a wolf (why a wolf, if ever?) could give it some horsepower. Okay, pun was totally unexpected in there. So non-existent Japanese and Cream Stew aside, what went wrong? In the first place, that kind of talk format worked before in SHUKUDAIKUN and HIMITSU. Don’t even get me started on what a hoot it was in C, D, G no ARASHI, and pardon me for making those old shows as my standard because it really is in terms of Arashi’s trademark of fun and spontaneity. So yeah, what went wrong? Because clearly, it was boring until Matsujun came out in those bloody fugly Macmillan jeans. Even the performance was standard. Were they ill-prepared for this so-called “power-up”? Are they getting tired of variety? Are my and everyone else’s expectations high? I can only hope that to this day, Arashi still has the artistic license over the content of their shows and all their work. With their concerts, I have no doubt they do. But with their TV shows, I am starting to have doubts. That or the boys themselves want to move into a more “serious” direction considering that they are now in their 30s and probably think that they’re too old to be doing foolish experiments or baka stunts on TV. Now, this is where they could learn a thing or two from SMAP. SMAP x SMAP has been on air since 1996. Yes, I repeat: 1996. In the vicious ratings game, 17 years is a feat. It’s a major achievement. What makes it tick? I’m not the best person to answer this but based on what I have intermittently seen over the years, the show has remained consistent all throughout. SMAP has mastered what works for them and they stick to it. The Bistro format and the skits (I watched that one with Taiwan’s F4, that was hilarious), among others. Except for VS ARASHI, I haven’t seen that consistency in any of Arashi’s recent shows, case in point HIMITSU and now, SHIYAGARE. Okay, granted reformatting a show to make it better is a worthwhile effort because one should never just be complacent and coast along on a steady buzz. But what had been happening is the haphazard addition of “corners” to make it more “interesting”. That tedious-whatever restaurant corner, anyone? In the end, it gives the feeling that there is no concept at all except to have a smorgasbord stew, I mean, show. Throw in some of that pepper, it might become spicier. How about adding some rotten apples? HIMITSU had a concept, and an appealing one at that: secrets of Arashi. Who doesn’t want to know? But until when can there be secrets? We now know what happened to that show. SHIYAGARE also had an interesting, though limiting concept, that the staff seemed to have realized now that’s why they’re opening it to female guests. It’s worth a try but wouldn’t this be VIP ROOM all over again? Not that it’s a bad idea because that worked back in HIMITSU. But say, why don’t they go back to basics? I’m sure they’ve asked the question on why people love Arashi, especially their old shows. Because it gave us that feeling that we’re eavesdropping on five friends doing their thing on TV, which didn’t look much except watching five bums fooling around and having a hoot of a time. It was fun. It was spontaneous. It was so down-to-earth. I don’t care about Arashi wearing tailored suits on TV and looking kakkoi, and sitting on stools (can they have more comfortable seats please?). I see a lot of their kakkoiness in dramas and appearances in other shows and on magazines. They can reserve their cool music performances for MUSIC STATION and KOHAKU, and definitely, their concerts. But when I watch an Arashi variety show, I just want to cry unabashedly or roll in laughter with them. Remember MAGO MAGO? An Arashi variety show, for a fan like me, is the place where the boys let their hair down and not be the idols that they are. Am I alone on this one? I hope not. SMAP has discovered what works for them and has stuck to it. I’m sure Arashi knows what works for them as well. And considering that they’re catering to the Japanese TV market, I’m sure they know very well how their audience want to see the familiar and the consistent, or how else could have SMAP x SMAP lasted this long? For me, the secret and strength of Arashi’s success is their strong bond and them just being themselves. Plain and simple. No need for horse logos that look like wolves or horrors of horrors, an Arashi election (?!) (A BIG NO ON THIS ONE, PLEASE; isn’t it enough for Ohno to say that it hurts him when fans rank Arashi? And really, what would it achieve except divide the fandom?). Send them to Kumamoto or even Timbuktu. Do an Arashi training camp every week if you must. Just let them do what they best do: being themselves, having fun together. After everything that’s been said, I really wish Arashi can mark their silver anniversary not only through concerts but on their own TV show. Because the fact that there are still people tuning in to their TV sets to watch you on a weekly basis 25 years down the road just shows the staying power you have. And heck, when that time comes, they’re not just going to sing 50 hits. If Ohno’s knees, Sho’s sloping shoulders, Aiba’s stubborn feet, Nino’s “one-pack” and Jun’s back would still allow (I’m sure of that because even Goro and Nakai-san–nevermind if he was sweating and picking his nose on live TV–were able to do it), they’d do a full concert right on TV, overtime be damned. agree with you. i mean, our boys, when doing a tv show, should stick to what originally they were doing when they started making shows that made fans watch it not only because they feel they need to support it but because it best shows the boys as them. no script. no ‘make-up’. just friends hanging out and being silly regardless of their age. what you said actually is applicable for all the younger groups, not just Arashi. we can only hope that our respective boys will reach SMAP’s longetivity in the industry as a group. but maybe that is the very same reason why they feel the need to “diversify” and change directions, to set them apart from one another. I just miss the old Arashi shows that would have me in stitches. le sigh. I think I understand the change in Shiyagare – Arashi (or the staff, or management) wanting to change directions or try something different especially that all of Arashi are now in their 30s. Less of the ‘baka’, and more mature segments. However, like you, I felt that the pilot episode of the new Shiyagare was disappointing. (I would have to watch it with subs though to reconsider.). “we’re eavesdropping on five friends doing their thing on TV” – This. Honestly, I want to see Arashi doing location shoots again. Like visiting a certain town or prefecture and interacting with the townsfolk. Just like good old MMA days : ) I do hope that the new Shiyagare gets better; I’m sure it will. Any fan of Arashi wouldn’t have to stop reading just because of some criticism. I agree with pretty much everything you said! Arashi is at their best when they are just let loose and free to be themselves. Perhaps it’s just overexposure as of late–I have been holding my breath waiting for people to say “enough already!” since every year Arashi’s presence becomes ever more pervasive. I’d hate to say it, but maybe it’s the fact that they are doing three shows at the same time and SMAP was smart enough to keep it down to one. I do agree on the overexposure and I’m glad the shows are down to 2 now. Tbh, there wasn’t much difference between AniShi and HnA so it was actually a blessing in disguise they lost HnA. At least there is a pronounced difference in the concept of VSA and AniShi, though they need to work on the AniShi concept more. Last night’s episode was not bad and that may be because of the guest or the topic (many were reminded of Shukudaikun). Leave the boys alone to do their thing and they’ll be fine. No need for fancy sets or topics that only isolate their audience. Ah, love your article here. That’s true though.. I love Himitsu and Shiyagare basic. Now the power up of shiyagare, I certainly have doubt with it, when I watched it, I don’t even found it interesting. Woman guest, Ueno Juri episode is interesting I think but that’s looks like Himitsu all over again with some difference. I do hope they will have segment like Mago-Mago again. You just can see whet they are, not with suit but with a t-shirt and jeans, try to get grandpa and grandma opened to them. Or baby-sitting kids when their parents are away..
I’m looking forward to this week’s SHIYAGARE to see how they have sorted things out since the “power up”. And yes, I do miss their MMA days and those late night shows that they were allowed to do their thing without getting them trapped in their No. 1 idol image. I agree too, ive noticed also aiba chan is not like before ,where he is really funny and does “baka” thing actually all of them , ohno got even more quiet on tv shows..i missed the old days where i really cried for laughters just watching them doing crazy things…I hope the managements or julie will think of something like shukudai again for shiyagare.. I love your words here, for me, sometime Shiyagare just let me down. I love the old ‘them’, but I understand that we cant denied that they getting matured and have an image to take care off, so they have to let go their old self, the crazy and dorkiness, which is for me, a lot. Just take a look at CnA, where they have to face-off public anger. Or DnA or GnA, or MMA. Seriously, I just missed them. I think this is a problem with ratings. Old Arashi shows may be interesting but all of them belongs to a time when Arashi is unpopular. So even if fans compare, it actually doesn’t matter because ratings for those won’t high and it will be dismissed.